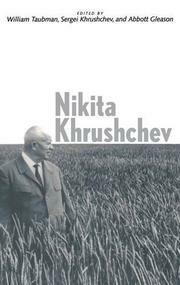 It’s not often that the proceedings of a conference are read by anyone other than the participants (and often not even by them), but this book, originating in an international conference on the centennial of Nikitia Khrushchev's birth, is both important and even moving. Khrushchev is one of the most remarkable and paradoxical figures to have arisen in the Soviet or any other system. A convinced Communist, an admirer and close collaborator of Stalin, he was intimately involved with some of the worst purges of the 1930s and 1940s. In Moscow archives, his signature (as the party secretary) appears on the list approving the execution of thousands of party functionaries—5,000 of whom were shot as part of Moscow's quota. As a regional party boss in the 1930s, he deported more than two million people from the western Ukraine. “I’m up to my elbows in blood,” he said after his retirement. “I sincerely believed in Stalin at the time and did everything. . . . That's the most terrible thing, what burdens my soul.” And yet, even at the height of the purges, Khrushchev took considerable risks in seeking the rehabilitation or release of some accused, even in the face of Stalin's irritation. And while his famous secret speech condemning Stalin was agreed to by the Presidium, it was, writes Vladimir Naumov, an “act of high civil courage” that could have, if it had gone wrong, cost him his life. Solzhenitsyn himself credited Khrushchev with a profound spiritual impulse in his determination to release prisoners from the Gulag. But the importance and subtlety of these analyses lie in the nuances that the authors, approaching Khrushchev from so many perspectives, bring to his life. One revelation is the evidence that the public, unlike the intellectuals, may have disapproved of the speech. A book that underlines why Gorbachev was almost inconceivable without Khrushchev.